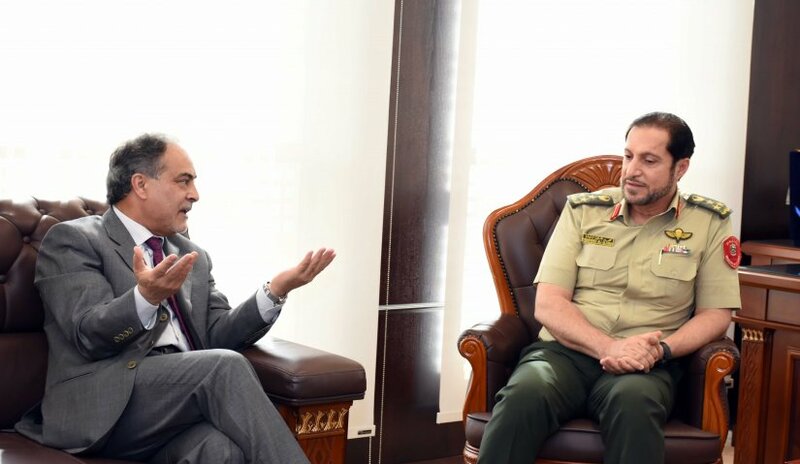 Prof. Abdelhafid Belarbi, Al Falah University’s President headed a delegation and visited the Ministry of Defense Headquarters in Dubai to discuss a cooperation between the two parties. Dr. Khaled Heneidi, Dean of College of Mass Communication and Prof. Nasr Abbas as part of the AFU delegation were welcomed by Brigadier General Mohamed Ali El Banna and Brigadier General Abdullah Humaid Al Falasi, Office of His Highness the Minister for Special Affairs. During the meeting, several issues were discussed including the role played by the Ministry in serving UAE in terms of security and safety and AFU’s role in helping the local community and interacting by the means of scientific research, conferences or workshops to raise awareness on important national and international issues. “We Are All Partners in The Security of Our Homeland"